The most important facet of the function of living cells is the synthesis of proteins. Because proteins carry out multiple tasks in the body, the mechanism to synthesize them is highly intricate. Despite the overall complexity of this process, it occurs with remarkable accuracy. The rate of error is roughly one in every 10,000 amino acids. 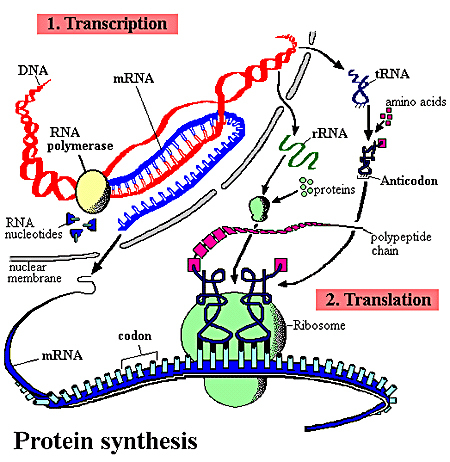 Using the processes of transcription and translation, the body makes an amazing number and variety of proteins. The protein must fold to obtain the correct secondary and tertiary structures. Protein folding remains an active research area. There are several stages involved in the synthesis process, including transcription and translation. The illustration above (Protein Synthesis) shows the process whereby DNA encodes for the production of amino acids and proteins. Before the synthesis of a protein begins, the corresponding RNA molecule is produced by RNA transcription. One strand of the DNA double helix is used as a template by the RNA polymerase to synthesize a messenger RNA (mRNA). This mRNA migrates from the nucleus to the cytoplasm. During this step, mRNA goes through different types of maturation including one called splicing when the non-coding sequences are eliminated. The coding mRNA sequence can be described as a unit of three nucleotides called a codon. The primary role of deoxyribonucleic acid (DNA) is to direct the synthesis of proteins. DNA, however, is located in the nucleus of the cell, and protein synthesis occurs in cellular structures called ribosomes, found out-side the nucleus. The process by which genetic information is transferred from the nucleus to the ribosomes is called transcription. During transcription, a strand of ribonucleic acid (RNA) is synthesized. This messenger RNA (mRNA) is complementary to the portion of DNA that directed it: as it has a complementary nucleotide at each point in the chain. A specialized protein called an enzyme controls when transcription occurs. The enzyme called RNA polymerase is present in all cells; eukaryotic cells have three types of this enzyme. DNA has a section called the promoter region that identifies the sites where transcription starts and must be recognized by one subunit of the RNA polymerase called the sigma (s) factor. Recognition between the promoter and the s-factor helps to regulate how often a particular gene is transcribed. Once bound, the polymerase initiates the construction of mRNA (or other RNA molecules). Initiation of the synthesis of a new RNA molecule does not always lead to a complete synthesis. After roughly ten nucleotides have been strung together, the continued addition of complementary base pairs takes place more readily in a process called elongation. The speed of addition of new nucleotides is remarkable—between twenty and fifty nucleotides per second can be added at body temperature. Eventually the elongation process must stop. There are certain sequences of nucleotides that stop elongation, a process called termination. Often, termination occurs when the newly formed section of RNA loops back on itself in a tight formation called a hairpin. Once the hairpin structure has formed, the last component is then a string of uracil residues. After transcription has taken place, the mRNA produced is not necessarily ready to direct the subsequent protein synthesis. Depending on the type of cell, segments of nucleotides may be removed or appended before the actual synthesis process takes place. This type of post-transcriptional processing often occurs in human cells. The ribosome binds to the mRNA at the start codon (AUG) that is recognized only by the initiator tRNA. The ribosome proceeds to the elongation phase of protein synthesis. During this stage, complexes, composed of an amino acid linked to tRNA, sequentially bind to the appropriate codon in mRNA by forming complementary base pairs with the tRNA anticodon. The ribosome moves from codon to codon along the mRNA. Amino acids are added one by one, translated into polypeptidic sequences dictated by DNA and represented by mRNA. At the end, a release factor binds to the stop codon, terminating translation and releasing the complete polypeptide from the ribosome. One specific amino acid can correspond to more than one codon. The genetic code is said to be degenerate. Once the mRNA has been synthesized, and perhaps modified, the next step of protein synthesis, translation, takes place. For this stage, additional forms of RNA are needed. Transfer RNA (tRNA) plays the role of carrying an amino acid to the synthesis site at the ribosome. tRNA molecules are relatively small, with around seventy-five nucleotides in a single strand. They form several loops, one of which is an anti-codon, a three-residue series that is complementary to the codon present in the mRNA. The opposite end of the tRNA is where an amino acid is bound. The correct binding of an amino acid to a specific tRNA is every bit as important as the anti-codon in ensuring that the correct amino acid is incorporated in the polypeptide that is synthesized. There are different tRNA molecules for each of the twenty amino acids that are present in living systems; some amino acids have more than one tRNA that carry them to the synthesis site. When translation begins, mRNA forms a complex with a ribosome to form an assembly site. This complex requires the assistance of proteins called initiation factors, so the existence of an mRNA does not mean that a protein will always be synthesized. The first tRNA that takes part in the initiation always carries the same amino acid, methionine. When the protein is completely synthesized, this initial methionine is often removed. With the initial methionine in place, another tRNA with its amino acid joins the assembly site as dictated by the codon on the mRNA. With two amino acids present, a peptide bond can be formed and the polypeptide can begin forming. The new amino acid is added to the carbon end of the polypeptide (the C-terminus) with the peptide bond forming between the C-O of the polypeptide and the amine of the new amino acid. This structural specificity is enforced by the nature of the binding between the amino acid and the tRNA. The portion of the amino acid that is unbound in the tRNA complex is the amine. The tRNA–amino acid complexes must be made. This complex must bind to the mRNA-ribosome assembly site. The correct amino acid is assured by the matching of the anti-codon on the tRNA to the codon on the mRNA. A peptide bond is formed between the new amino acid and the growing polypeptide chain. The amino acid is cleaved from the tRNA, which can be cycled back to form another complex with an amino acid for a later synthesis. The growing polypeptide forms a fiber-like tendril. The ribosome essentially moves along the mRNA, reopening the initiation site for additional protein synthesis. In this way, proteins are synthesized by several ribosomes acting on the same mRNA molecule. The structure of the ribosome plays an important role in this elongation process. There must be two sites available for synthesis to occur. One site, called the P site (for peptide), is where the growing (or nascent) polypeptide is located. Adjacent to this location is another site where the tRNA with its new amino acid can bind. This site is called the A site (for the amino acid that is delivered there along with the tRNA). As was the case in the elongation of mRNA noted earlier, somehow the emerging polypeptide must stop adding amino acids. The termination is actually part of the coding present in the codons. Three specific codons are known as stop codes, and when they are present in mRNA, the elongation is stopped.